Beautiful kitchen dining area. The Arlington Chairs in Coleman White leather look wonderful in the white kitchen with dark hardwood floors. 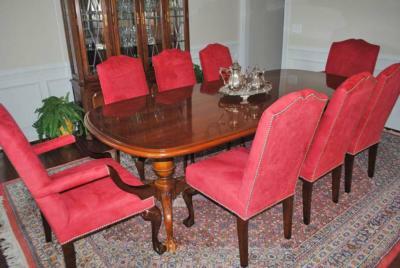 Dining room with six Raleigh Side Chairs and a pair of Westminster Host Chairs, all of which are upholstered in Molly Red Microfiber. 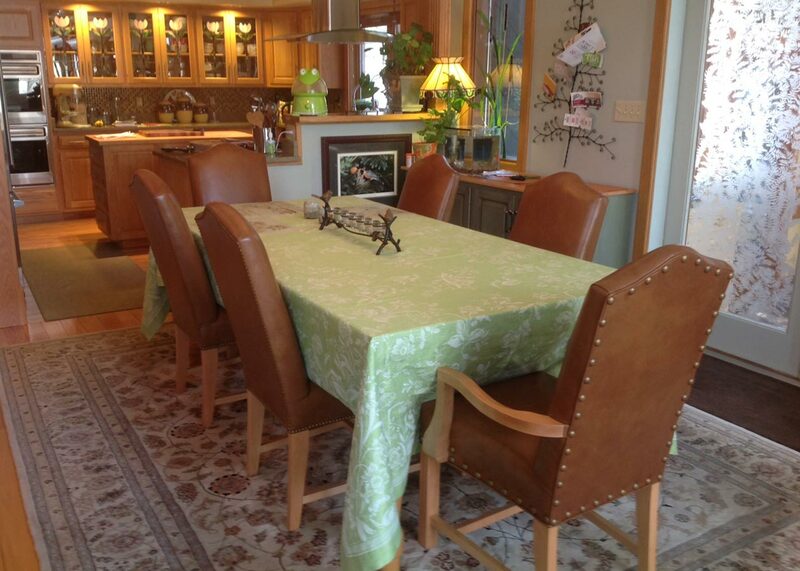 This customer sent in her own fabric and leather for these highly customized Cambridge Dining Chairs. 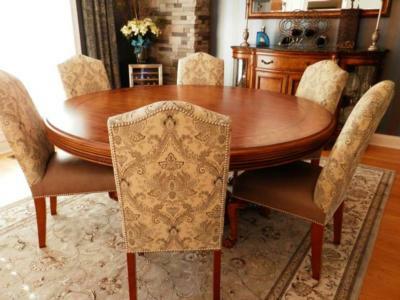 The chairs have been modified by adding a camel back and changing the Chippendale legs to Ball-and-Claw. This custom Cambridge Dining Chair looks amazing with this round table. 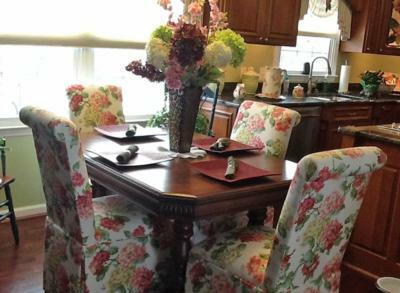 The customer supplied her own fabric and leather. Additionally, she added a camel back and switched the Chippendale legs with Ball-and-Claw. 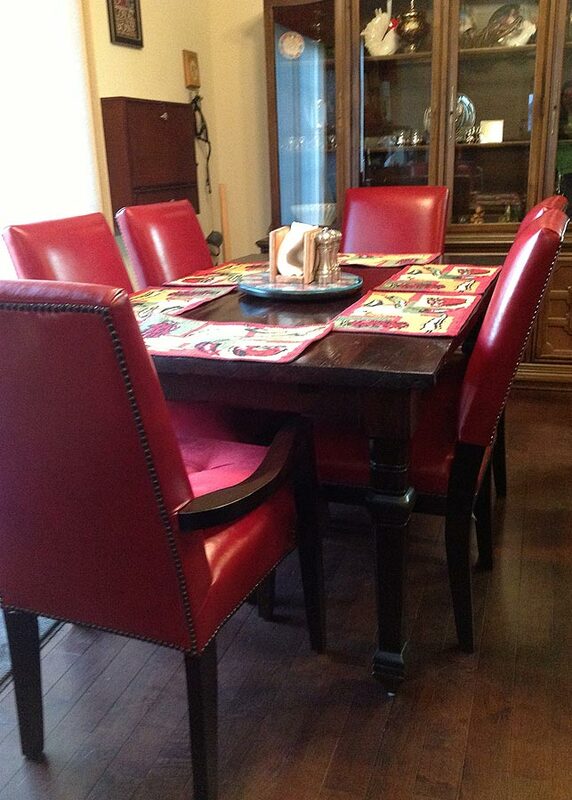 These Skirted Parsons Chairs in Ruby Alabaster look right at home around this customer's table, which has been in her family for 120 years! 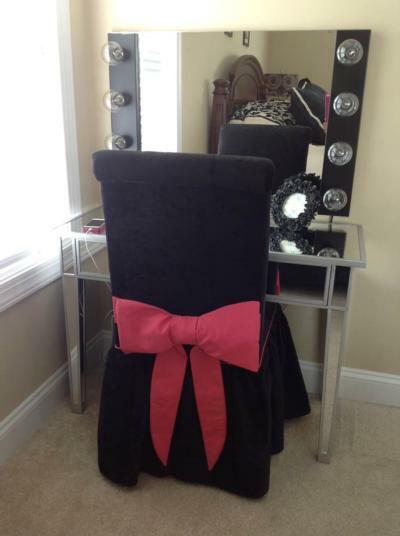 This Skirted Parsons Chair in Molly Black with a Susan Pink bow really livens up this vanity. 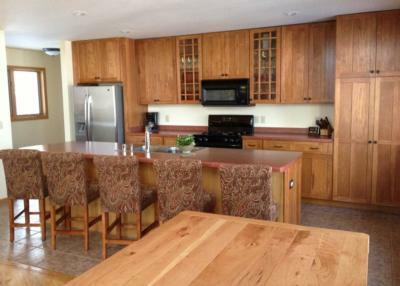 A beautiful bar lined with Palisade Counter Stools in a customer supplied fabric. 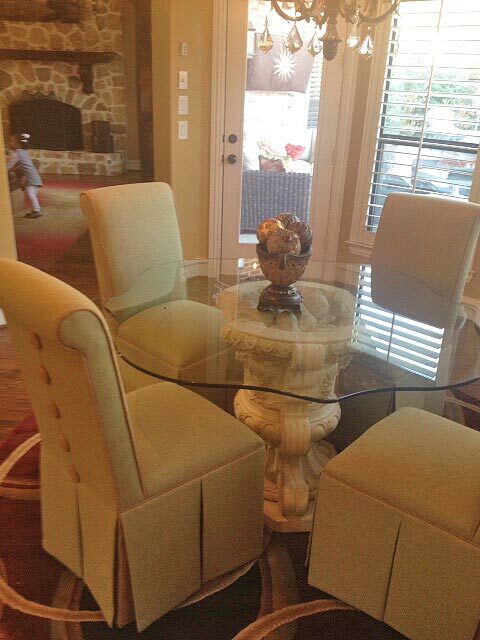 This Skirted Parsons Chair in Amber River fabric makes the perfect accent chair for this room. We love the stunning stained glass window just above it! 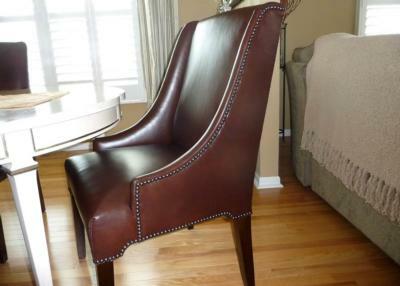 Gorgeous Litchfield Parsons Wing Chair in Yale Expresso Leather used as a host/hostess chair. 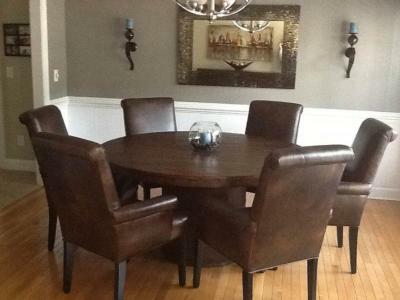 These leather Tisbury Arm Chairs encircling this round table give this dining room a masculine feel. 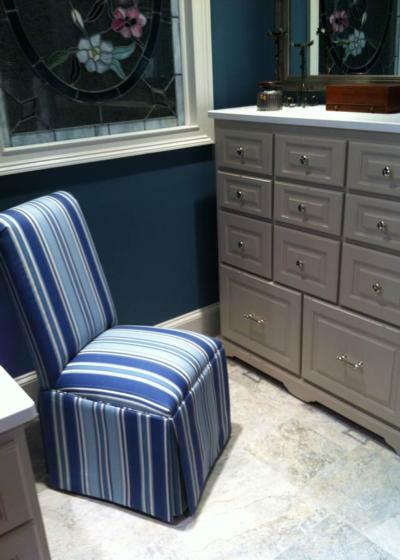 This customer's Parsons Chairs with Ruffled-Pleat Skirts in Lindsay Indigo were featured on HGTV's website. 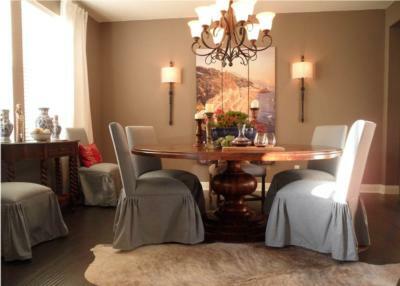 She certainly put together a gorgeous room. 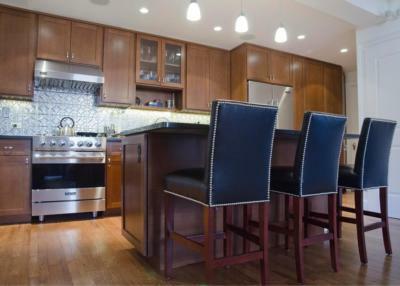 Beautiful kitchen bar with Mitchell Leather Counter Stools in Yale Black Leather. 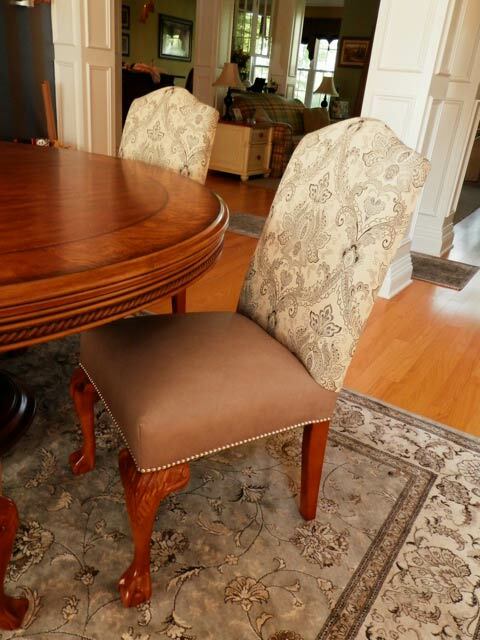 This customer opted for a distinctive combination of Chippendale side chairs with small, closely set nailhead trim and Arlington Arm Chairs with large, widely spaced nails. 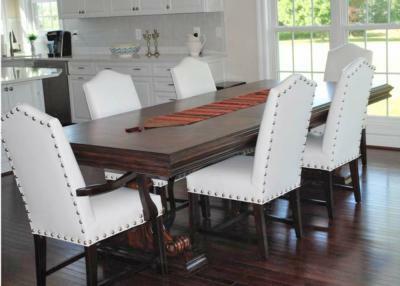 Beautiful dining area with customized Burlington Parsons Chairs. This customer requested a matching welt running up the sides and around the scroll back.